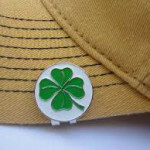 Our Golf Hat Clips feature a strong magnet to conveniently hold a ball marker in place on the brim of your hat so golfers no longer need not search through pockets to find it. The ideal logo gift for tournaments and charity outings, our hat clips accommodate the majority of customized metal ball markers. Combine a hat clip with a custom logo ball marker and a Microfiber Greens Towel to create a great gift combination that every player will love. 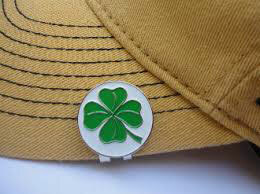 Golf Hat Clips are a gift your golf tournament participants will use and appreciate all year long, too. It also makes a great tournament sponsors gift idea. For a quote or more information about ordering a custom logo ball marker to go with your magnetic hat clip, simply click the “Request Quote” button below. Minimum custom quantity is 50 units. Set up fees may apply. Turnaround time is typically 10 Days from final art approval.